During the latter part of the 3rd decade of the 11th century, a Byzantine merchant ship made her way westward along the southern coast of Anatolia with cargoes she had taken on board somewhere along the coast of present-day southern Lebanon or northern Israel, then part of the Moslem caliphate of the Fatimids. Seeking shelter, she sailed before easterly winds into Serçe Limanı, a natural harbor on the southern coast of Turkey opposite Rhodes (seen right). When the ship reached a protected anchorage within the harbor close to the weather shore, the crew cast an anchor, but before a second anchor could be set, The ship was driven onto the rocks and sank, coming to rest at a depth of about 33 meters. 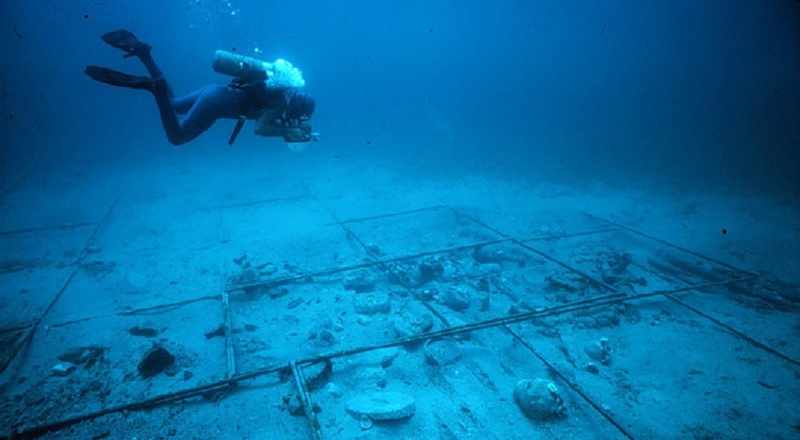 An expedition of the Institute of Nautical Archaeology and Texas A&M University excavated the Serçe Limanı wreck during the summers of 1977-79. Popularly called the Glass Wreck, it had been chosen partly because of large quantities of broken glassware visible on the site, and also because almost nothing was known about how ships were built during the period to which the wreck belonged. The ship had been a small two-masted vessel with lateen sails. The mainmast was stepped slightly aft of amidships, and the foremast, with a somewhat smaller sail, had probably raked forward over the bow. The ship had an overall length of perhaps only 50 Byzantine feet (15 m) and a breadth of 17 Byzantine feet ( 5.3 m). 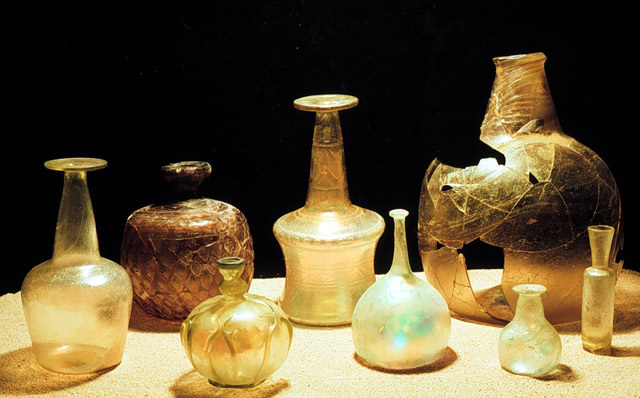 The glass cullet consisted of two tons of raw glass broken up into manageable pieces and one ton of broken glassware and glass-making waste from some Islamic glass factory on the Fatimid Syrian coast. Almost certainly transported in wickerwork baskets, it was being carried in place of stone ballast in the after quarter of the hold. On-going efforts to sort and mend between half a million and a million shards of broken glassware recovered from the wreck belonging to between 10,000 and 20,000 vessels. Bass, George F. “The Shipwreck at Serçe Limanı, Turkey.”Archaeology 32 (1979): 36-43. Bass, George F. “Archaeologists in Wet Suits.” In Science Year 1982:The World Book Science Annual, pp. 96- 111. Chicago, 1981. Bass, George F. “The Nature of the Serçe Limanı Glass.” Journal of Glass Studies 26 (1984): 64-69. Bass, George F., J. R. Steffy and F. H. van Doorninck,Jr. “Excavation of an 1lth-Century Shipwreck at Serçe Limanı, Turkey.” National Geographic Society Research Reports 17 (1984): 161-182. Bass, George F., Sheila D. Matthews, J. Richard Steffy, and Frederick H. van Doorninck Jr. Serçe Limanı: An Eleventh-Century Shipwreck, Vol. I, The Ship and its Anchorage, Crew and Passengers. Texas A&M University Press, College Station, Texas, 2004. George F. Bass, Robert H. Brill, Berta Lledó, and Sheila D. Matthews. Serçe Limanı, Volume II: The Glass of an Eleventh-Century Shipwreck. Texas A&M University Press, College Station, Texas, 2009. Jenkins, Marilyn. “Early Medieval Islamic Pottery: The Eleventh Century Reconsidered.” Muqarnas 9 (1992): 56-66. Describes how the excavation revolutionized accepted views of early medieval Islamic art. Pulak, Cemal, and Rhys F. Townsend. “The Hellenistic Shipwreck at Serçe Limanı Turkey: Preliminary Report.” With “Appendix. The Transport Amphoras: Description and Capacities,” by Carolyn G. Koehler and Malcolm B. Wallace. American Journal of Archaeology91 (1987): 31-57. Steffy, J. Richard. “The Reconstruction of the 11th century Serçe Limanı Vessel. A Preliminary Report.” International Journal of Nautical Archaeology 11 (1982): 13-34. ABOVE: Some of the many types of glassware found on the Serçe Limanı shipwreck (Photo: INA, Slide# GW-1183).